By Aragon Garcia: Mikey Garcia (39-0, 30 KOs) says he’s not worried about being the smaller guy in his upcoming March 16 fight against IBF welterweight champion Errol Spence Jr. (24-0, 21 KOs), because he knows what he’s capable of doing to a fighter like him. Spence has a lot of victories, but he’s not faced anyone with the pedigree that Garcia has That’s what could hurt Spence when he gets in there with Mikey and finds out the hard way what it’s like to face a world class fighter for the first time in his career. Mikey is committed to proving his many doubters wrong on March 16 when he meets Spence inside the squared circle at the huge AT&T Stadium in Arlington, Texas. Garcia is facing a fighter that a lot of people believe will end his career on March 16. Many boxing fans are under the perception that Spence will administer such a bad beating to Garcia that it’ll prematurely end his boxing career. Mikey has done a great deal of sparring with southpaws to prepare for Spence’s left-handed stance, and he’s also sparred middleweight to get ready for his size. Mikey expects Spence to be around 160 pounds on the night of the fight, which would make him an average sized welterweight. “I knew what I was signing up for, so I’m prepared for that,” Garcia said to Fighthub about him being ready to fight a bigger guy than him in Spence. “I don’t know any other way to be. I’ve never been nervous about [Spence]. I know what I’m capable of doing. It probably worries everybody else, because they haven’t seen the best out of me. You guys haven’t seen everything I’m capable of, but I know what I’m capable of. That’s why it doesn’t worry me,” Mikey said. The way that Mikey is talking, you can’t help but to believe him that he knows something that the boxing world doesn’t. Mikey has never had to show his full potential during his career, because his wins have come so easy for him. He hasn’t had to push himself hard to win four division world titles. Now that Mikey is moving up to a fifth weight class to face the perceived best fighter in the weight class, we could see that his skills are too much even for a fighter as good as 29-year-old Spence. Mikey isn’t a deluded fighter. He knows his limitations. If he was a fighter that was out of touch with reality, he would be calling out fighters from the 154 and 160 lb weight classes like Jarrett Hurd, Gennady Golovkin and Saul Canelo Alvarez. 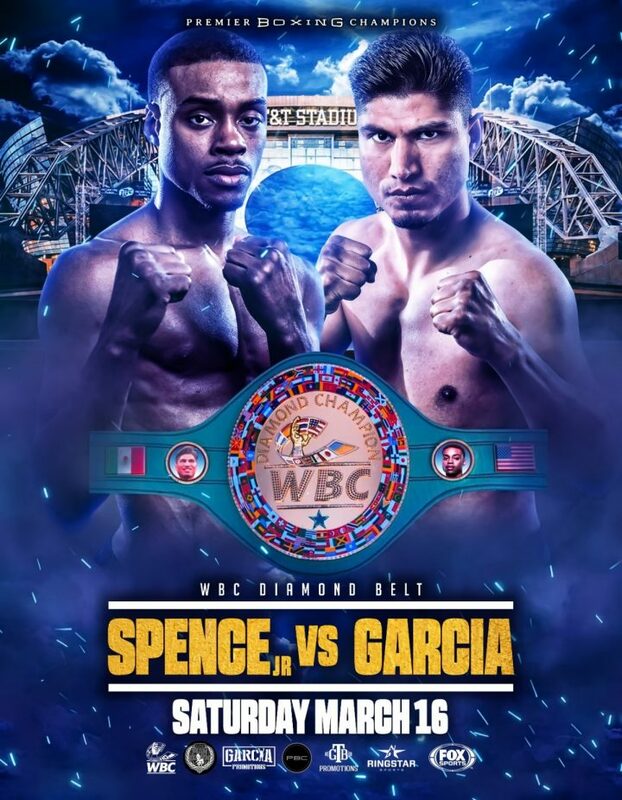 Garcia, 31, wanted the Spence fight because he’s seen flaws in his game that he knows he can exploit in this fight on March 16, and beat him. It might come as a shock to the boxing fans when/if that happens, but it won’t be a surprise to Mikey, since he knows what he sees when looking at Spence’s past fights. “He knows he needs this fight in order to achieve greatness, to get to where he wants to be in ordered to be recognized and have a good name,” Mikey said about Spence. “I need this to establish me as one of the best. I need to win this fight to make people realize I’m not than what they ever thought, because I’m moving up in weight,” Garcia said. Spence probably won’t be viewed as a great fighter if he beats Garcia. That’s not accurate on Mikey’s part in saying that Spence needs this fight to achieve greatness. The reality is Spence won’t achieve greatness from this fight. He’ll gain some popularity, to be sure, but mostly boxing fans will say that Spence won because of his size, and they’ll discount his victory. The only fighter who gains from this contest is Garcia, not Spence. This is just a payday fight for Spence. He’s in the same situation Vasyl Lomachenko was in when he defended his WBO super featherweight title to super bantamweight Guillermo Rigondeaux, who moved up in weight two divisions to fight Loma without a catch-weight last year. Mikey is the one that can achieve greatness, because he’s doing the impossible, taking on the guy that boxing fans view as unbeatable in the 147 lb division. “I did have to gain a little bit more mass, and a little bit more muscle, because I’m fighting a bigger guy,” Mikey said. “I want to be a little bit bigger just to hold my own. I don’t plan on being the stronger man. I’m going to be explosive, and I’m going to be fast. That’s why I went to SNAC to prepare,” Mikey said. “I didn’t bulk up too much; just enough to give me a little bit more mass. I do feel good. I feel fast, which is what we’re going to be needing on fight night,” Mikey said. This will be a first for Garcia with him coming into the contest as the underdog. He’s always been the favorite until now. This is a new experience for Garcia, 31, and it’s one that has him motivated. When you’re always expected to win, as Mikey has, it becomes boring after awhile, because the fights aren’t considered to have drama behind them. Well, things are much different now with Mikey fighting Spence as the underdog, and he’s going to have to prove that he can beat a guy that’s a heavy favorite to defeat him. “We’ve been sparring southpaws with height and reach,” Mikey said. Mikey is not only sparring southpaws, he’s also sparring middleweights with more size than the 5’9 1/2″ Spence. So when Garcia does get out there inside the ring with Spence on fight night in less than two weeks from now, it’s not going to be a big shock for him to be fighting a guy that outweighs him and has a big height advantage. Mikey will have already fought against fighters like that in sparring. Spence might come in a lot heavier than 160 pounds on fight night. Mikey is being too conservative in predicting what weight Spence will rehydrate up to after the seconary weigh-in. A lot of boxing fans expect Spence to be in the low 170s on the night of the fight, which is a lot more weight that what Mikey is predicting he’ll be at. Mikey’s weight is likely going to be in the mid-150s. If Spence comes into the fight at 170 on fight night, then it’s going to make it hard for Mikey to deal with his size. He’ll have to out-quick him. The IBF rehydration rule could make things difficult for Spence if he’s weight rained for the fight from having to keep his weight no higher than 157 lbs on the morning of the fight for him to make weight for the secondary weigh-in. This is the International Boxing Federation’s rule, and there’s no getting around it by Spence unless he wants to blow off the weigh-in by either skipping it or coming in over the weight limit. That’s not likely to happen, though, considering that Spence has dreams of unifying the weight class. He can’t unify the welterweight if he’s going to blow off the secondary weigh-in on the day of the fight.